Embracing the area�s design and manufacturing community, the Capital City Arts Initiative is hosting its exhibition, �Industrial Art,� from June 9 through Sept. 17 at the CCAI Courthouse Gallery. 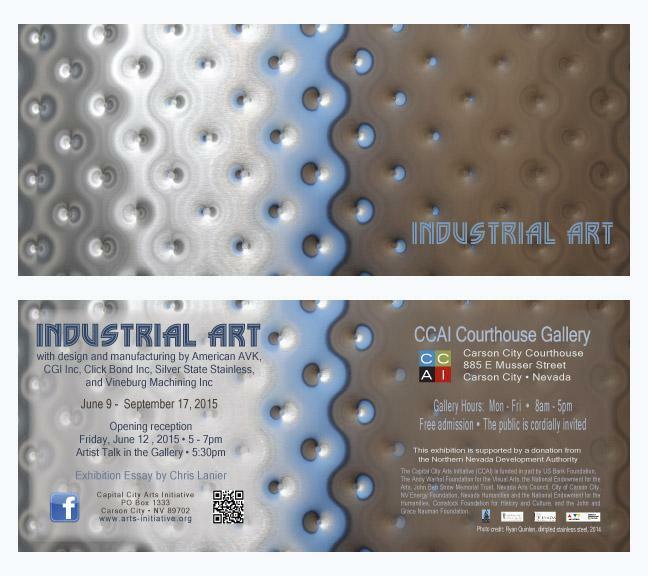 �Industrial Art� presents the design work of five manufacturers in the Carson City area, including American AVK, CGI Inc., Click Bond Inc., Silver State Stainless, and Vineburg Machining Inc. These companies manufacture products with innovative design that applies to an array of commercial applications. CCAI presents these products, created for specific industrial uses, as items to be admired in their own right for their design, precision, and beauty. American AVK in Minden manufactures fire hydrants, objects so commonplace they often go unnoticed, with colorful housings containing many precision valves. CGI Inc. creates products for a variety of industrial applications from precision gearboxes to electromechanical items for aerospace systems to semiconductor applications. Click Bond Inc., home of the original adhesive bonded fastener, specializes in ways to fasten items together with structural adhesives for the international aviation industry. Silver State Stainless manufactures stainless steel tanks for the beer, wine, and food industries. Vineburg Machining Inc. creates precision-machined components for the aviation, automotive, and medical fields. Each of these firms relies on product design and research to keep them on the leading edge of their industries. The show includes a brew tank constructed by Silver State Stainless specifically for the exhibition, a fire hydrant, and numerous gears, prosthetic devises, and intricate elements. Artist and writer Chris Lanier has written the exhibition essay. He has a background in both traditional and digital media, and has worked in multimedia performance, digital animation, web production, and comics. Lanier is also an essayist and critic whose art criticism has appeared in a variety of online and print publications. He is an Associate Professor of Digital Art at Sierra Nevada College in Incline Village. Lanier earned his M.F.A. in Studio Art at the University of California, Davis, in 2007 and his B.A., Art and Society at the New College of California, San Francisco in 1994. He lives in Reno with his family. A reception will be from 5 to 7 p.m. Friday, June 12, at the gallery. A short introduction of the exhibition participants will be at 5:30 p.m. The Courthouse Gallery, open from 8 a.m. to 5 p.m. weekdays, is at 885 E. Musser St. The reception and the exhibition are free, and the public is cordially invited. This exhibition is supported with a donation from the Northern Nevada Development Authority. The Capital City Arts Initiative is an artist-centered organization committed to the encouragement and support of artists and the arts and culture of Carson City and the surrounding region. The Initiative is committed to community building for the area�s diverse adult and youth populations through art projects and exhibitions, live events, arts education programs, artist residencies, and online projects. City of Carson City, NV Energy Foundation, U.S. Bank Foundation, Nevada Humanities and the National Endowment for the Humanities, Comstock Foundation for History and Culture, and the John and Grace Nauman Foundation. For more information, go to www.arts-initiative.org.